Ducking through the small door of the fifth oldest pub in England you go back to another era. It is like entering another world and a reminder of times lost. Two small rooms, each with their own open roaring fire, welcome travellers into their fold. Collections of trinkets, brasses, tankards and mining equipment fill the low ceiling and, in fact, every available space. Almost hidden away are steps leading up to "the cave"- a tiny room up in the roof which cosily holds a long table and benches either side. The pub has been home to a long line of innkeepers who were also miners and farmers. For years a shaft in the pub's cellar went down to a mine where the man of the house used to work during the day while his wife tendered the animals and brewed beer. The only trouble is, sadly it�s been closed since 2005. I do hope nobody tries to book a room via the website. 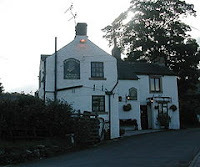 This was a great pub, described in past editions of the Good Beer Guide as �a connoisseur�s pub�. For many years it sold only one, locally-brewed real ale, firstly Winkle�s Saxon Cross Bitter and then Ward�s distinctive malty brew from Sheffield. It didn�t, when I remember it from the late 80s, even serve meals, although obviously from the website it did later bow to commercial reality. How many more lost pubs still linger on in cyberspace?